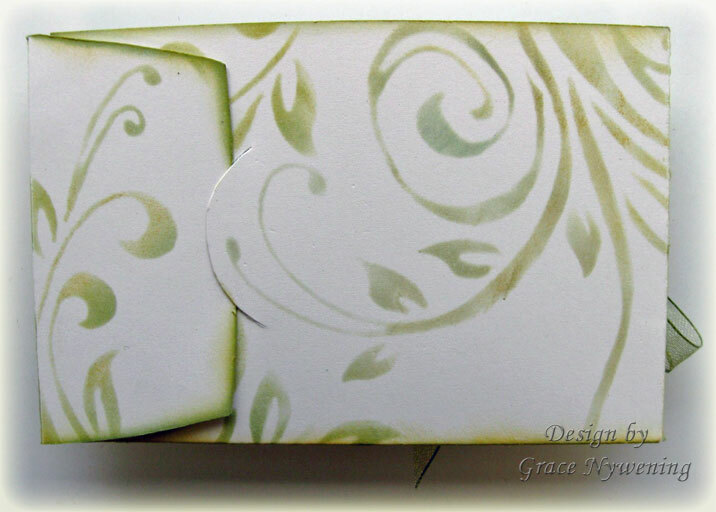 This is a little gift card holder I made using the new Art Stencil release from Layers of Color, "Natural Flourishes" Art Stencil. 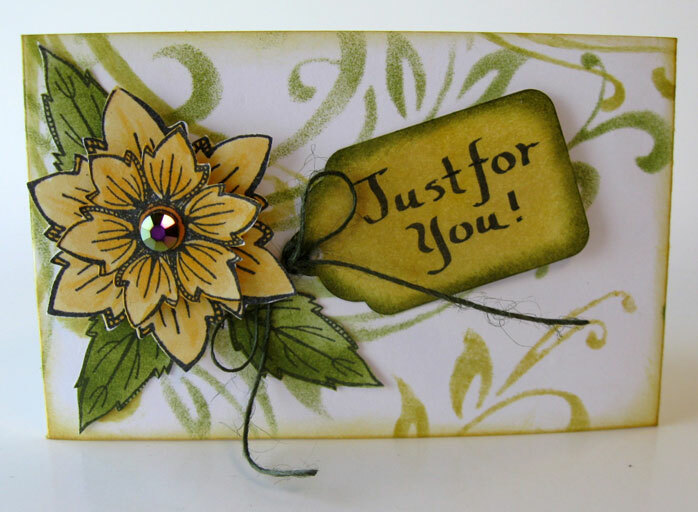 For the flower, I used the LOC Art Stamps set "Nature Walk". Don't be intimidated by all the pictures... it is very easy! 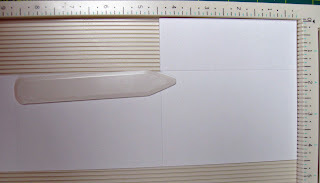 To begin, cut your card stock to 10 1/2" x 4 1/2". Score along the short side at 4 3/8" and 8 3/4". Now cut two sections off at 2 7/8" high and score the rest of this line. 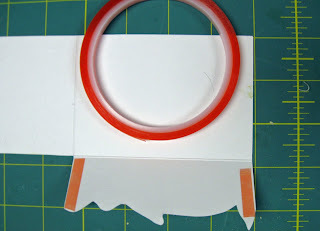 (You will cut the short section and the adjacent long section, leaving the last long one.) This will form your pocket. 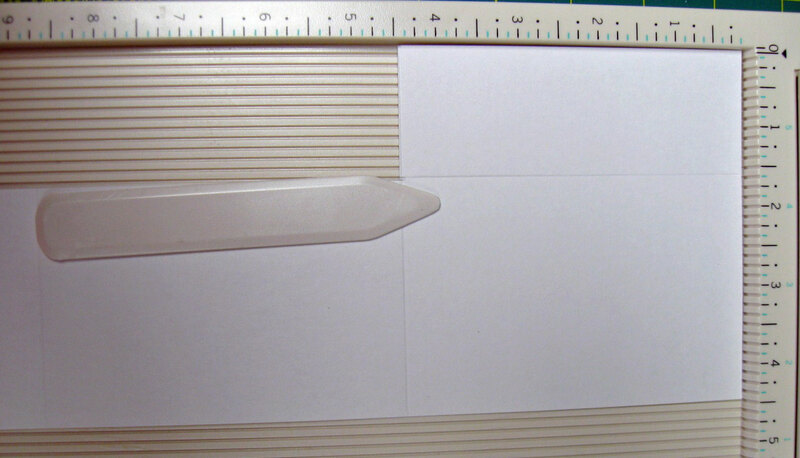 Fold up your score lines and mark an end tab. 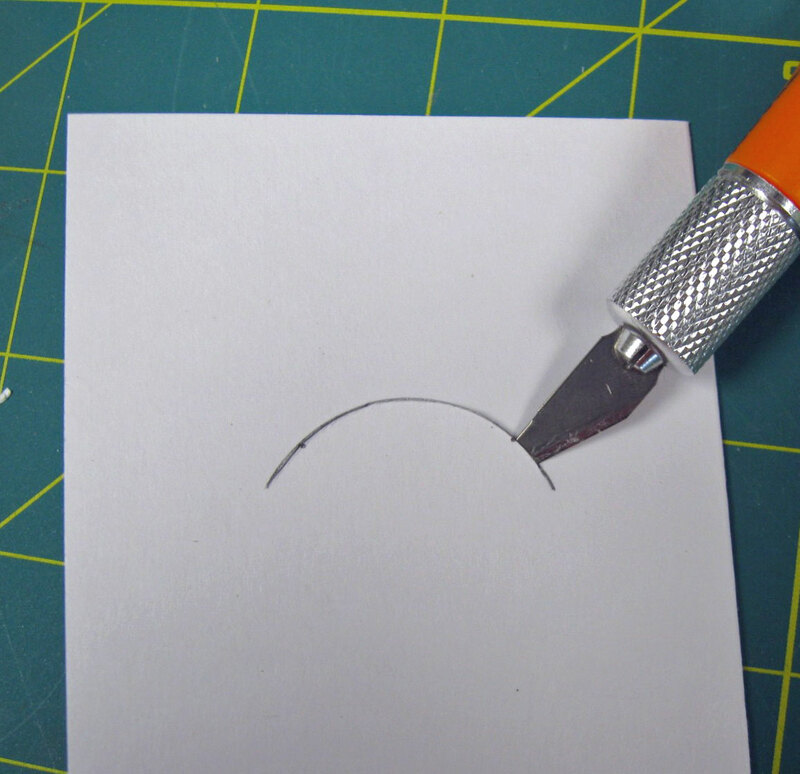 I drew a circle using a Ink Refill bottle centered on the end of the smallest section, then drew my edges a little tapered. You could just leave the sides square if desired. Now close the end flap over the back and place light pencil marks where the tab will need to fit into the back. Mark a semi-circle between these dots that extends a about 1/4" beyond them (better to be a little big than not big enough) I used a small Shimmerz bottle for my pattern on this. 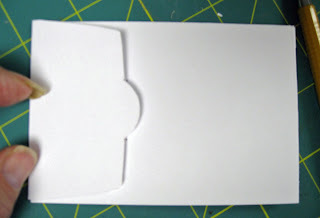 Unfold, and using a Craft blade, cut this slit. 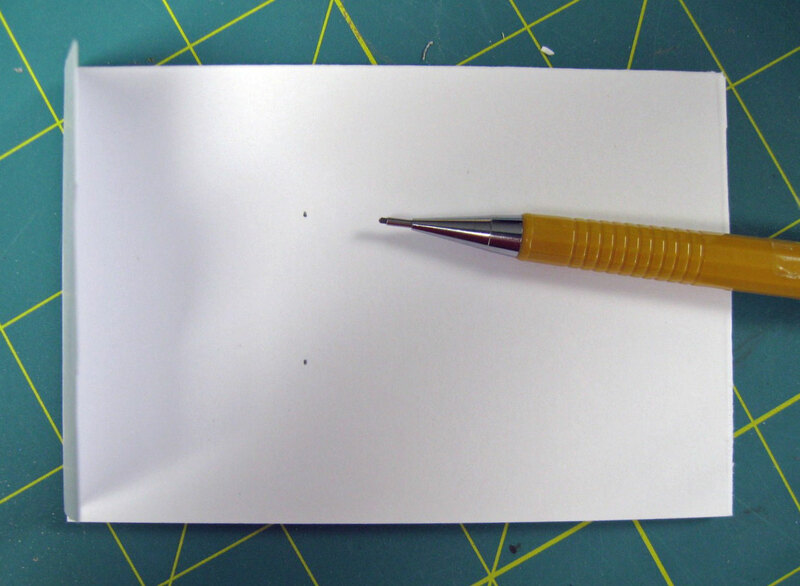 Erase any pencil marks that are visible. 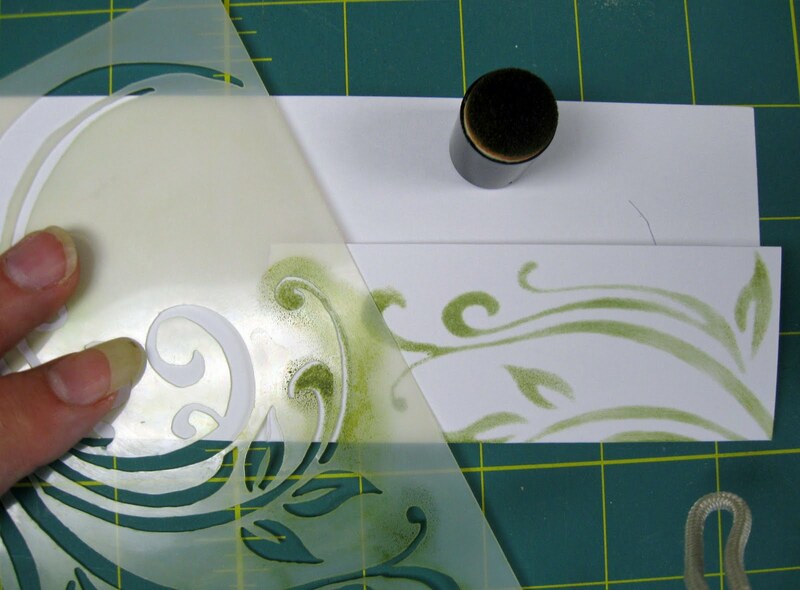 Now open all folds and lay your stencil on the paper, moving around until you find a pleasing pattern. Tip: I began by doing the pocket that will hold the card first, as that swirl line is what I used to cut along to give a little extra character to my pocket. 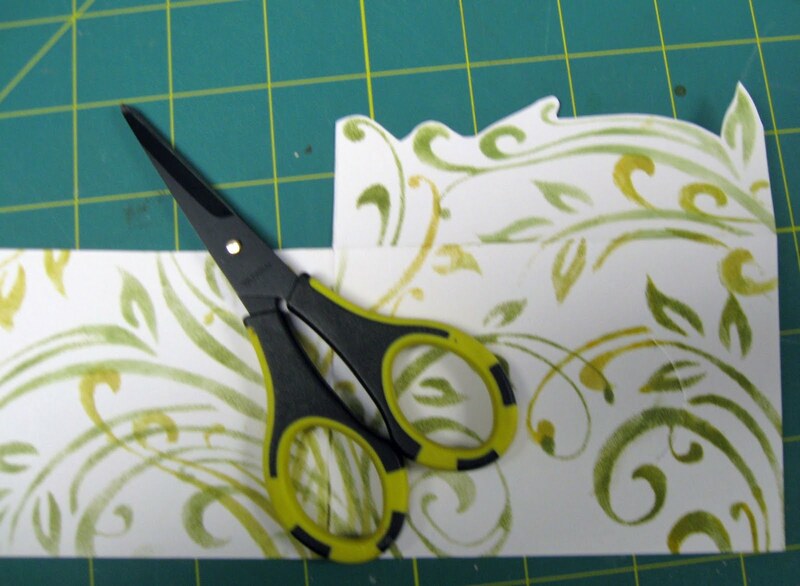 Now using a good pair of paper snips, cut off the top part of the "pocket" loosely following the design you created with your stencil. I think this gives it a lot more character than just leaving it a straight cut. Using high tack tape, apply to each short end of your pocket. Pull off the pink protective paper and adhere to the inside of the card, forming the pocket. Now simply decorate however you wish. For the sample above, I cut one large and one small flower from the Layers of Color Nature Walk Art Stamp set and colored with Copics, and I sponged three leaves from the set with the same green I used on the stenciling, and cut them out. I popped the flowers up and glued leaves in behind them. I hand wrote my message and punched out the tag with a McGill Tag punch, added some twine, sponged and adhered to card front. One gemstone in the center of the flower finished it off. 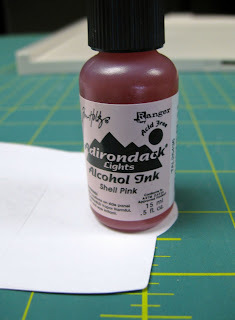 Below is another option for finishing it off. I used Back Yard Birds Art Stamps to stamp my bird, colored with chalks, cut out and adhered. I added the little green ribbon and used SU! punches to punch out the SU! sentiment. The flowers are Prima. I hope you enjoyed this tutorial and that you will give it a try, adding your own touches! If you do I'd love a link so I can see it! Have a blessed week! Beautiful gift card holder Grace!!!! OOOOO I just LOVE your stamping on this...soooo pretty!! AWW thanks for the AWESOME tutorial!!! Hope you have a wonderful day sweets! Ohhh wowwww Grace,So beautiful card,i love your image and your paper. Wonderful project and tutorial, Grace!!!! This is wonderful. You are such an inspiration to me! Thanks for sharing your creative gifts. These are fabulous! I love the stenciling, the greens are fabulous and the bird is excellent! Great tutorial too! Hello Grace - what a fabulous tutorial - I love this project and know I will be casing you - these days the kids like to give money or vouchers for birthdays and this is the perfect way to give them! I love the colours and the way you have used the Natural Flourish Art Stencil - gorgeous! Grace this looks beautiful - what a way to give a gift card - must remember this and case it some time soon!! WOW Grace!!! What a fantastic gift holder!!! Anyone would be thrilled to receive a gift card this beautifully presented!!! Your tutorial is wonderful!! 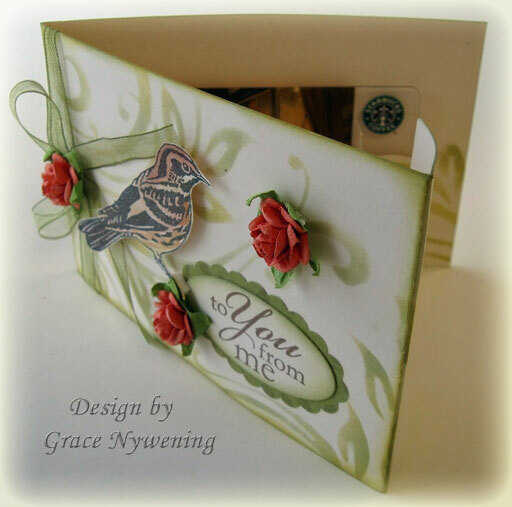 This is a gorgeous gift holder and tutorial Grace!! I may have to get this stencil and case it. LOL! Seriously stunning GF!! TTYS!! Miss you!! 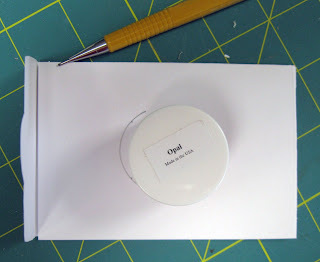 Thanks for sharing a great project and the tutorial -- but I couldn't image making one as gorgeous as yours -- it is a gift without any gift card enclosed! So very pretty!! Great gift idea! What a gorgeous gift holder! I love the swirls and flowers and that bird is wonderful with that sheer ribbon! 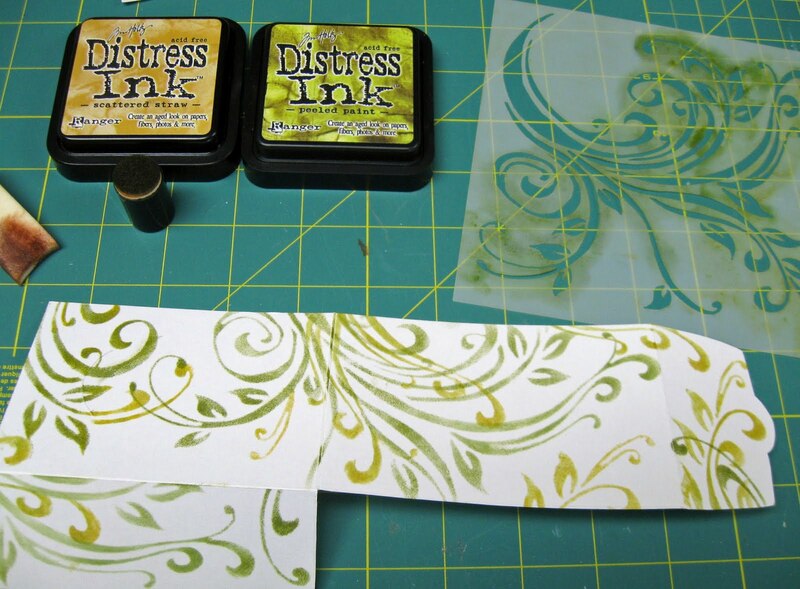 I love that you thought to tell me to not be afraid to combine the colors of Tim Holtz Distress Ink. I never thought of that! It looks so beautiful...elegant. This would be a beautiful wedding check holder! Wonderful tutorial, too, Grace! You are the best!! 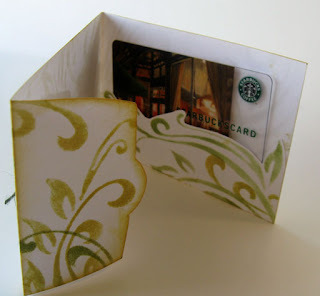 this is wonderful way to give a gift cards..like the design and the detail about it..thanks for sharing it with us.Gift Card envelopes. I love your beautiful Gift Card holder! 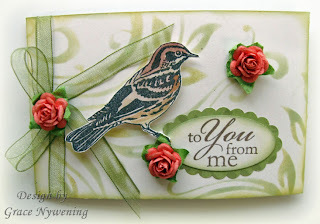 Your stenciling is so pretty with the various greens and the added bird and flowers/sentiment on the front is lovely too.